Received wisdom has it that Nordic jazz is essentially cool, reflecting the climate, and atmospheric, reflecting the fjords and the landscape. Eirik Berg Svela’s music is certainly cool, although it takes its cue from a coast thousands of miles from Norway. Indeed, in the promo for another, home-based quartet, Svela admits to having an unhealthy obsession with New York guitarists. The international quartet he fronts here confirms his commitment to the American jazz tradition. Louisiana-born Hammond organist Sam Yahel, English saxophonist Dave Edge and Norwegian drummer Tore Thorvaldsen Sandbakken all have their own voices and approaches but their playing and support allow Svela to emphasise his love for – and to add to – the music that came out of the great Blue Note and Prestige recordings of the 1960s. Very often on these sessions, the tunes called out were standards that all the musicians would know. This was of necessity because records were made at such regular intervals and with such short available studio time that the leaders didn’t always have new original material to play. Of the nine tracks here, one, I’ll Be Seeing You, is a standard and another, New Arm Rash, is a contrafact, a new melody written over an existing chord sequence, in this case that of There Will Never Be Another You. The other seven tracks are Svela originals and it often seems to this listener that the guitarist has, whether by collision or decision, created what might turn out to be new standards. He has a terrific ear for melody and he has developed the knack of creating chord changes and arrangements that his fellow musicians clearly love extemporising over. The stepping stone-like bridge that follows Shame (On) Us’s twisting and turning initial statement and End of Days’ rising progression are just two examples. The title track opens the album. A smartly executed melody with guitar and saxophone partnering one another through sometimes intricate cornering, it’s a statement of intent in several ways. Svela takes the first solo with a bluesy display of logical, melodic invention and fluent solo-building, including a nice handover to Edge who, with a mixture of legato lines and staccato notes, creates heat while his pacing remains cool. Yahel and Sandbakken also take solos – and is that a sly reference to Wives and Lovers from the eminently resourceful organist? – but this is a rare occasion when all four musicians solo on one tune. Svela clearly gave thought to rotating soloing order as well as programming and the result brings freshness to the listening experience. Next Time I See You is a fine example of Svela’s ability to conjure up new numbers that feel almost immediately familiar. Buoyed by Sandbakken’s light, springy drumming, Yahel, Edge and Svela all solo lucidly, with the organist reprising the melody before going back for more, as it were, and Edge sounding not unlike his fellow Englishman, the late, great Tubby Hayes. Shame (On) Us, with its spunky, rhythmical guitar intro, is dedicated to saxophonist Seumas Blake, hence the bracketed “on”, and End of Days, as with I’ll Be Seeing You, features just guitar, organ and drums. Svela articulates its mood of regretful nostalgia over Yahel’s superbly understated organ support and pulls out a particularly soulful solo. Crossword enthusiasts might already have noticed that New Arm Rash is an anagram of Warne Marsh, whose tenor saxophone style would have suited its tangling, searching melody. 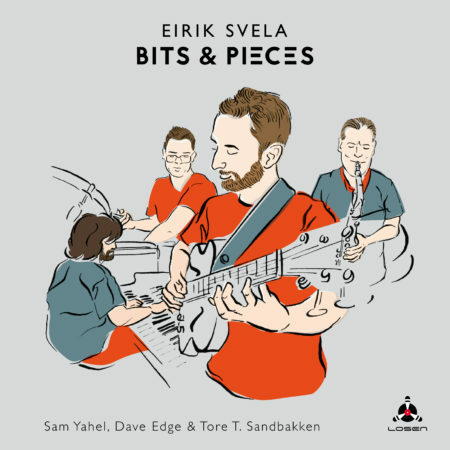 Having set the tempo, Sandbakken kicks the group along authoritatively and elicits a muscular improvisation from Edge between Svela and Yahel’s quick-thinking choruses before soloing concisely and driving towards the crisp coda. Na and In Awe Of are another two of Svela’s compositions that invite his colleagues to express themselves and Yahel responds on the former with lovely tonal variations and superb note choices. Edge is both assertive and vulnerable on the latter, a ballad that starts out melancholic but has a soulfully uplifting effect as exemplified by the repeated saxophone phrase on the fade-out. The teacher to whom Svela dedicated the composition assignment T.E. will surely be proud of the association. Reminiscent of Charles Mingus’s “Ah Um” band channelling a close relative of The Pink Panther theme, it has a church music quality emphasised by Yahel’s preaching style and Edge sounds like he might be – successfully – auditioning for the Mingus Big Band, whose Ronnie Cuber he has played with on occasion. Which brings us to I’ll Be Seeing You, where Svela’s aforementioned unhealthy obsession with New York guitarists morphs into full-on admiration for an Indianan, Wes Montgomery. Like George Benson before him, Svela knows the potency of Wes’ octave double stopping style and its potential for injecting urgency into guitar phrases and he signs off with possibly the strongest solo of the set, although it does have quite a lot of competition.